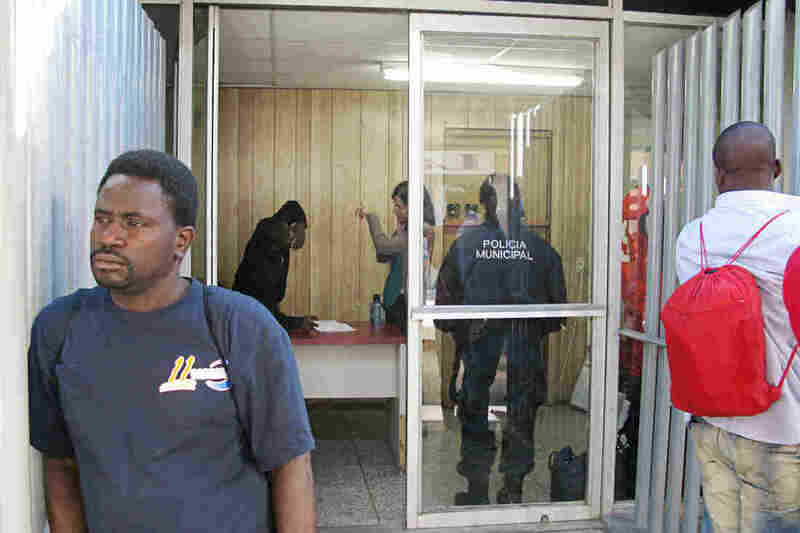 Haitian nationals at a Mexican government immigration office near the port of entry between Nogales, Sonora, Mexico, and Nogales, Ariz., wait day after day for appointments with U.S. immigration agents so they can enter. As a result of the Haitian influx and a continuing surge of Central Americans on the Texas-Mexico border, the U.S. government has run out of detention space. Desperate Haitian immigrants have been massing along the U.S.-Mexico border for months seeking humanitarian relief. In the past year more than 5,000 have sought entry into the United States — a 500 percent increase over the previous year. After the catastrophic 2010 earthquake in Haiti, thousands of citizens migrated to Brazil looking for work. But as Brazil has slipped into recession in recent years, many of them have hit the road again, heading north on a 6,000-mile journey to the U.S. border — by every means of conveyance. "Taxi, bus, plane, bicycle, boat, horses, and we've walked for five days," says Pierre Smith, 34, a smiling, broad-faced accountant from Port-au-Prince. He's staying at the San Juan Bosco, an immigrant shelter on a barren hilltop in Nogales, Mexico, while he and 100 of his countrymen wait to cross into Nogales, Ariz. These Haitians want the same generous benefits that were extended after the earthquake, when they got protection from deportation and temporary work permits. But the U.S. welcome mat is gone, and the new wave of Haitians is in for a harsh reception. The Homeland Security Department announced new rules in September. All Haitians who show up at the border without papers and who don't ask for asylum are now detained. Pierre Smith knows this. He and others like him won't be granted asylum because they're fleeing poverty, not political persecution — so once they cross, they will join nearly 4,500 other Haitians currently in the custody of Immigration and Customs Enforcement (ICE). San Juan Bosco, an immigrant shelter on a barren hilltop in Nogales, Mexico. Once the Haitian migrants cross the border they will join nearly 4,500 other Haitians currently in the custody of Immigration and Customs Enforcement. "When I get there, I don't mind staying in detention," he said, standing on the front steps of the shelter in a black muscle shirt. "I am looking for a better life." As a result of the Haitian influx and a continuing surge of Central Americans on the southern border of Texas, the government has run out of detention space. This is why the Haitians are bottlenecked all along the western U.S.-Mexico border. In Nogales, immigration agents only grant three appointments a day because there's nowhere to put the newcomers. Yet Smith and the others remain undeterred. "We have already sacrificed — we spent more than three months traveling to get here," he says. "So we will wait." 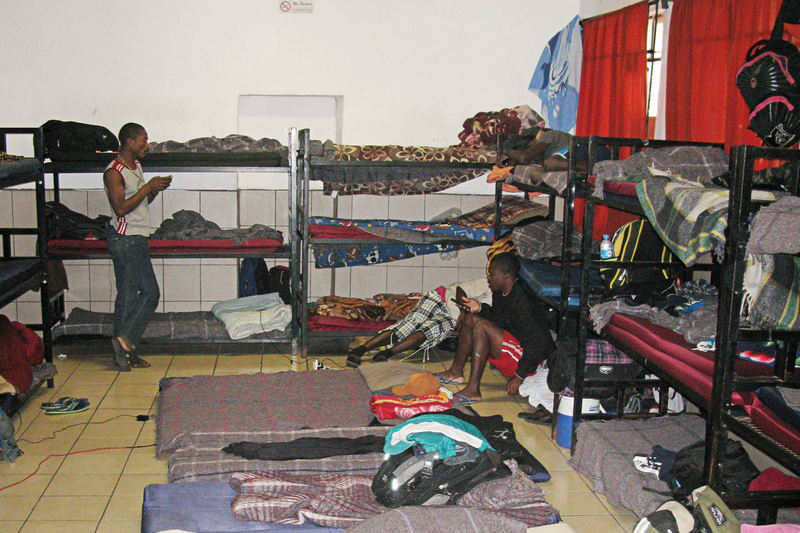 Immigration activists are outraged at the policy of mandatory detention for Haitians. "Instead of looking for more detention space, why not give them humanitarian parole so that they can work in the U.S. and have a more dignified way of life?" asks Father Sean Carroll, a Jesuit and the director of the Kino Border Initiative in Nogales, Ariz.
One answer is compassion fatigue. The United States allowed in 60,000 Haitian immigrants as a result of the earthquake. Now officials have heard that as many as 40,000 more have left Brazil for the United States. The U.S. doesn't have enough jail beds for all of the immigrants presenting themselves at the border. In recent months, the total number of immigrants in detention has jumped to 41,000. Normally, it's between 31,000 and 34,000. "This is an unprecedented, exponential increase in immigration detention rates," says Joanne Lin with the National Legislative Office of the American Civil Liberties Union. Earlier this month, Homeland Security announced it is signing contracts for more detention space in the same private, for-profit jails that have generated enormous controversy. The United Nations Working Group on Arbitrary Detention released a report last month citing testimony about degrading living conditions, bad food, poor medical care and understaffing at the private jails where immigrants are housed. It called for a halt to punitive detention for noncitizens who are not criminals. ICE maintained in a statement that the for-profit lockups are "a safe and humane environment for all those in its custody." Back at the shelter in Nogales, Mexico, Pierre Smith eats chicken and rice, charges his cellphone and waits for his appointment with a blue-shirted U.S. immigration agent. He prays that somehow he will be able to join his relatives in South Florida. "It's better to die than to return to Haiti," he says, "because life will be really, really, really difficult for us." The U.S. government had temporarily suspended sending Haitians home because of damage caused by Hurricane Matthew in early October. But in recent weeks, ICE resumed deportations. U.S. Rep. Yvette Clarke, a Brooklyn Democrat whose district has a large Haitian population, joined with 13 other members of Congress to ask Homeland Security Secretary Jeh Johnson to stop the deportations. "In this period of turmoil," she said in a letter Nov. 9, "the forced removal of Haitian nationals will only exacerbate the difficulties of rebuilding Haiti and deny families access to remittances from relatives in the United States." But ICE is moving ahead with the deportations. Since late October, the agency reports that about 200 Haitian nationals have been repatriated — with thousands more to go. A Nov. 23 Homeland Security press release says ICE "plans to significantly expand removal operations in the coming weeks."